The "Bhote Kosi", in Nepali, literally means “Tibetan River”. The river rises as a torrential mountain stream in Tibet and is mostly class 6 once it enters Nepal. However, it becomes quite placid in reaches between Khadichour and Sukute and is a fun river with enough excitement for the whole family. Lots of easy stretches, with blue water, plenty of white sandy beaches and some class 2 rapids to get the adrenaline flowing, just so. 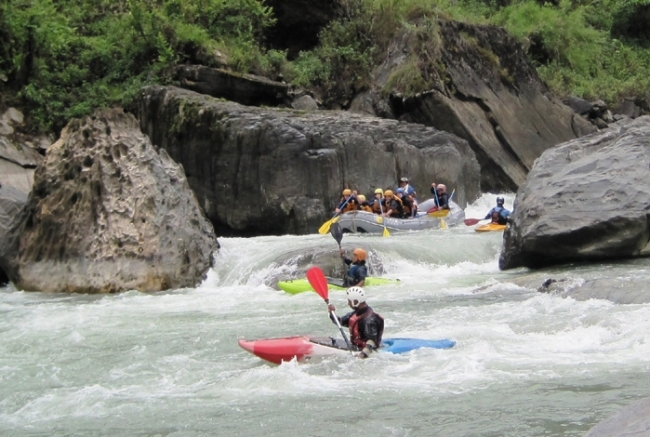 Following two days of sightseeing in Kathmandu, drive along the main highway to Tibet to the camp at Sukute where you will meet you captain and rafting crew, be briefed about your rafting trip and proper rafting etiquette. From Sukute re-board your transport and drive to Khadichour, your raft put-in point. Put in to the river, do as you"re told by the captain of the boat and enjoy your downriver trip! Take out is at Sukute where a hot lunch will be awaiting you. Drive back to Dhulikhel and overnight at one of the resorts here. Dhulikhel offers breathtaking panoramic views of the central Himalayan range and is a great place to watch the sun come up over some of the highest mountains in the world. Depending on the arrival time of your flight, sightseeing of Kathmandu. Day 03 Sightseeing of Bhaktapur city & Continue to go on Sukute ,Sindhupalchowk district . At resort , enjoy the environment of bank of Bhotekoshi river ,Sukute , Sindhupalchalchowk district where sounds the flows of Bhotekoshi river .